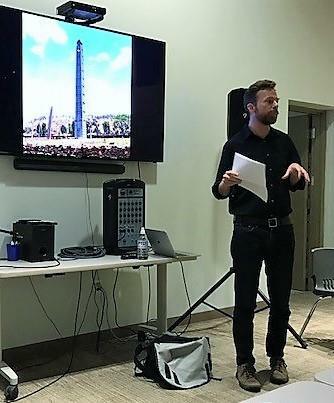 Main Street Guymon, an organization dedicated to the history, culture, and commerce of historic downtown Guymon, Oklahoma, hosted a lecture celebrating the cultures of local Ethiopian and Eritrean immigrants for International Archaeology Day 2018. Guymon has significant Ethiopian and Eritrean populations and so Main Street Guymon invited Dr. Dan Mains from the University of Oklahoma to come and tell attendees more about the cultures and people. He did a fabulous job, actually meeting with several of the Ethiopians in Guymon prior to the lecture and representing them to the group, too. The lecture was perfect for the community and helped to bridge some misunderstandings. Event organizers report that the community now feels better connected. The question and answer period was excellent and the questions actually went for 30 minutes past the expected time.